A Blog Of Ice Cream: Christmas Shopping? There's still time ... online! Christmas Shopping? There's still time ... online! Phewww .... I've actually done all my Christmas shopping - gifts for family and friends and I've even ordered the turkey! However, many of my friends have not and according to a BBC Radio program I was listening to, this seems to be the case for most people. Not to worry though because help is at hand - courtesy of the Internet. What would we all do without it now? Strange but for young people today they can't relate to that idea. Being from an older generation though, I can not only recall what life was like before the Internet but even before there were pocket calculators! I'm digressing a bit too much here .... so back to thinking about Christmas. One of my favorite gift ideas, especially at Christmas time, is the gourmet gift basket (or hampers as they're called in Britain). 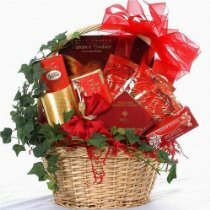 In the store you will find some wonderful gourmet gift baskets such as the Lindt Lovers Chocolate Gift Basket. The Sweet Wishes For You Basket pictured right is possibly one of the most stunning and appropriate gift baskets I've ever seen for Christmas. 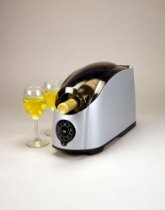 For British buyers there's a separate online store where you can buy a similar range of gifts including this electric bottle chiller (left) for making sure that the extra special bottle of Chardonnay you've bought is served at just the right temperature. Whether it's for a quiet romantic evening in or for when you have guests to dinner, it's a great piece of kit to have to hand. 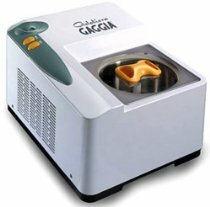 Serious lovers of ice cream could enjoy life so much more if they had this superb ice cream maker by Gaggia (right) which is really popular in Britain and Europe. Then when you've made your ice cream you should serve it in style - like in this fantastic, stunning-looking ice cream bowl and spoon set from Alessi. Whatever you buy for your friends and family this Christmas, I hope you try to make sure it's something they will find rewarding. Happy hunting!